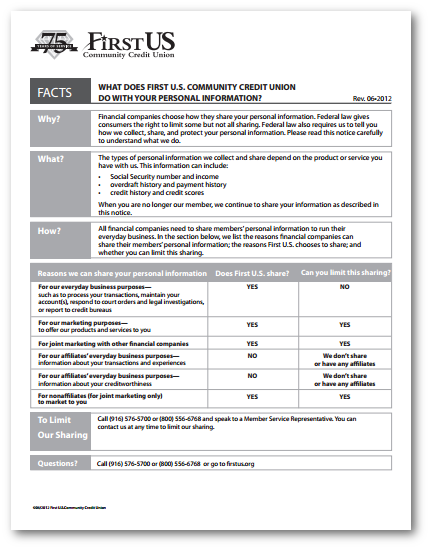 Facts What Does First U.S. Community Credit Union do with your personal information? Why: Financial companies choose how they share your personal information. Federal law gives consumers the right to limit some but not all sharing. Federal law also requires us to tell you how we collect, share, and protect your personal information. Please read this notice carefully to understand what we do. How: All financial companies need to share members’ personal information to run their everyday business. In the section below, we list the reasons financial companies can share their members’ personal information; the reasons First U.S. chooses to share; and whether you can limit this sharing. To Limit our Sharing: Call (916) 576-5700 or (800) 556-6768 and speak to a Member Service Representative. You can contact us at any time to limit our sharing. How does First U.S. protect my personal information? To protect your personal information from unauthorized access and use, we use security measures that comply with federal law. These measures include computer safeguards and secured files and buildings. How does First U.S. collect my personal information? First U.S. has no affiliates. Nonaffiliates we share with can include credit reporting agencies and insurance companies. Joint marketing partners can include insurance companies (like CUNA Mutual and LifeHelp).